TUSCALOOSA, Ala., Nov. 10, 2018 /PRNewswire/ -- The University of Alabama is expanding its services to help disabled military members fully access its Tuscaloosa campus with the launch of two specialized shuttle carts sponsored by Wells Fargo. The carts will provide free transportation from housing to academic buildings, student services, recreational facilities, and medical centers. The shuttles will be unveiled on the University of Alabama Campus on Shelby Quad on Nov. 9 at 11 a.m.
"We are honored to help the University of Alabama's Office of Veteran and Military Affairs support students who have served their country," said Phil Smith, executive vice president and head of Government and Institutional Banking for Wells Fargo. "The office plays a critical role in helping all military members transition to academic life and on to rewarding careers, including disabled veterans injured during their service. We hope the shuttles will deliver a much-needed solution to Alabama's campus transportation needs." The custom cart conversions were provided by Textron Specialized Vehicles. The first vehicle will be wheelchair accessible and the second vehicle will be a four-passenger shuttle designed to transport multiple veterans and their guests at one time. 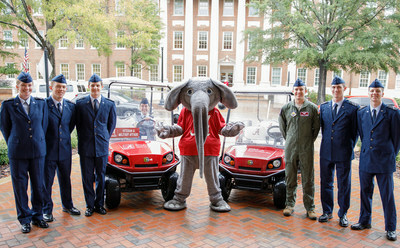 The shuttles will be operated by the University of Alabama's Office of Veteran and Military Affairs. "The launch of this program is so exciting, because it provides those who have sacrificed their mobility during their service to our country with reliable, accessible transportation throughout the campus," said David Blair, director of Veteran and Military Affairs at the University of Alabama. "The Tuscaloosa campus is quite large, and it can be challenging to get from building to building on a tight class schedule when you have some mobility issues. The new shuttle will help ease our military members' transportation needs and allows us to support their positive, rewarding academic experience." Joining Blair for the unveiling were Nancy Andes, Senior Relationship Manager Education & Nonprofit Banking- Wells Fargo, and Drs. Tim Hebson and David Grady, Dean of Students and Vice President of Student Life at University of Alabama, respectively. Founded in 1831 as the state's first public college, The University of Alabama is dedicated to excellence in teaching, research and service. We provide a creative, nurturing campus environment where our students can become the best individuals possible, learn from the best and brightest faculty, and make a positive difference in the community, the state and the world. You'll like what you find here. Become part of The University of Alabama family.